Close to the highway, downtown, the room was clean just a good experience altogether, will be coming back in the future. Can’t beat the price. Great deal for a basic breakfast and parking included. Breakfast was ok, should had some cream cheese for the bagels. Conveniently located, easy to find. Room was clean (although it could use a bit more vacuuming around baseboards and in corners). Great value for the price (off-season). Its near the lake and the attractions. There is a big parking spot so no problems for parking your car. The room was clean, the staff was very friendly. Location for niagara falls is awesome, for all the atraccion, restaurants all over. Hotel was better than we expected for the price. Staff was very friendly and helpful. We will stay here again. The Glengate Hotel & Suites This rating is a reflection of how the property compares to the industry standard when it comes to price, facilities and services available. It's based on a self-evaluation by the property. Use this rating to help choose your stay! 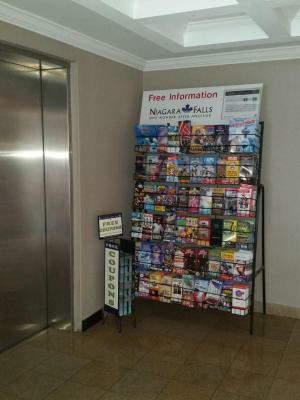 One of our top picks in Niagara Falls.Located within 15 minutes' walk of Fallsview Casino, this hotel offers free WiFi and a daily continental breakfast. All guest rooms are nonsmoking and feature satellite TV. The Glengate Hotel & Suites is only 0.9 mi from the lookout areas of the famous Horseshoe and American Falls. The shops, restaurants and entertainment options of Clifton Hill are also nearby. When would you like to stay at The Glengate Hotel & Suites? This suite features a large work desk, whirlpool tub, and a sitting area. This room includes cable TV, free Wi-Fi and a balcony. House Rules The Glengate Hotel & Suites takes special requests – add in the next step! The Glengate Hotel &amp; Suites accepts these cards and reserves the right to temporarily hold an amount prior to arrival. The Glengate Hotel & Suites accepts these cards and reserves the right to temporarily hold an amount prior to arrival. No egg in continental breakfast !!! It was old, run down, parking was not convenient. Floors were covered in stains. Upon first arrival to room, found dirty socks scattered around room and bathroom. Moved to next room just to find smaller bed when told it was exact same room, as well as hanging vent system in bathroom. Sheets looked reused. While checking out, was refunded very small amount after fuss with front desk. Will not be returning. Greeted kindly upon arrival. Location close to attractions. The breakfast needed more options. This place was great friendly staff very comfortable and clean. I definitely would stay here again. Loved the mini bar fridge in the room. breakfast es à "ok" in general but poor. No fruit, no water fountain or bottle, etc.. I wish there were more options for breakfast except only waffles, cereal and bread. The location, price, comfort and it was very clean. Breakfast was meh, could add maybe eggs or sausage next time? And the building definitely needs to be renovated. There was a bit of smell when we entered the room - like dusty/old smell but didnt notice after a while, and bathroom doorknob almost falling off but everything else was okay! Location was great and excellent customer service! Friendly staff! Old building but clean sheets. Hotel is located just outside niagara downtown(?) and 20 min walk to the falls or 5 min drive. Guests in other room were loud very late at night however front desk staff dealt with it promptly. 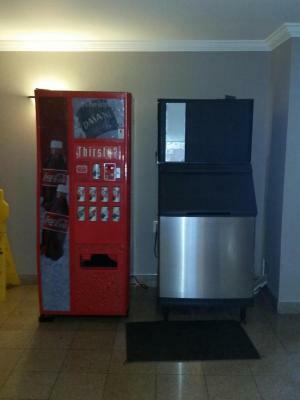 Conveniently located to convention centre and restaurants. Parking was available.